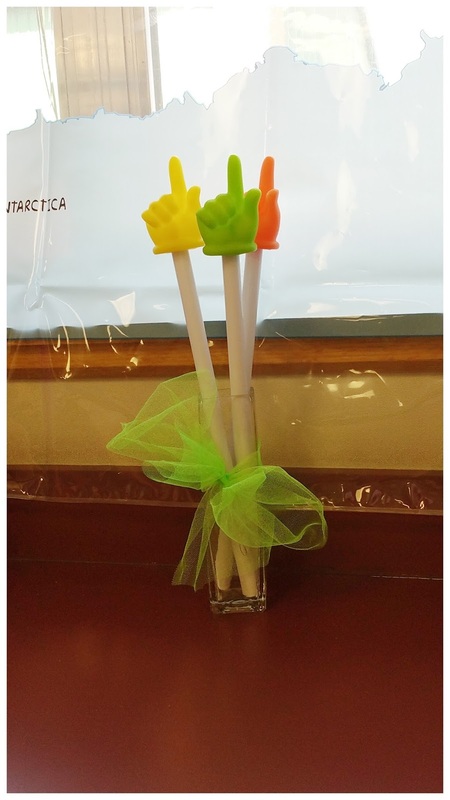 Teel's Treats: Moving on UP!! AH! Another school year is among us!! I know I was terrible at posting last year, (It has been 6 days shy of a year...) BUT I was juggling a lot!! This year I am making a BIG change. After spending 5 years teaching 3rd grade ELA, I am moving across the street to teach 6th grade Social Studies. I am a little nervous about this change since I haven't taught 6th grade kids and I am not really sure what to expect, but I am a lot of excited about this new adventure!! 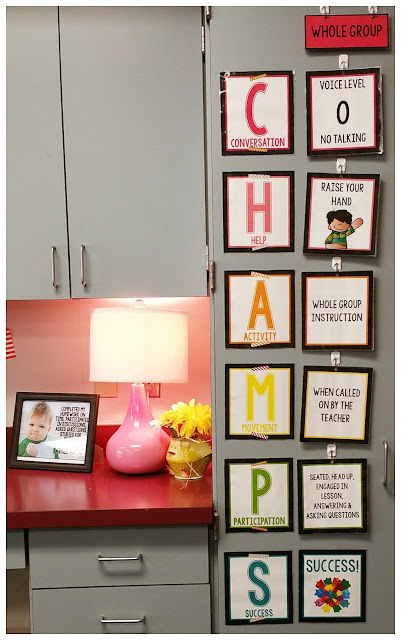 I am really focusing on my procedures and expectations so the kids know exactly what to do from the moment they step foot in my room till the moment they leave. I know that routine is important and it doesn't matter if your teaching 8 year olds or 18 year olds, if they know what is expected of them and you as the teacher implement your expectations -- they will thrive. 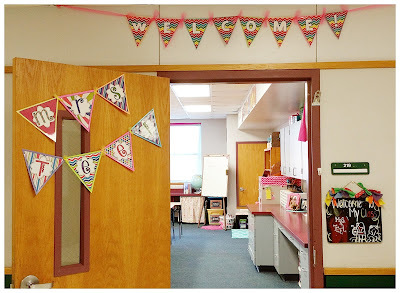 Entrance to my NEW classroom! WELCOME TO MRS. TEEL'S CLASSROOM!! My big ole classroom with the smallest desks I have ever seen! 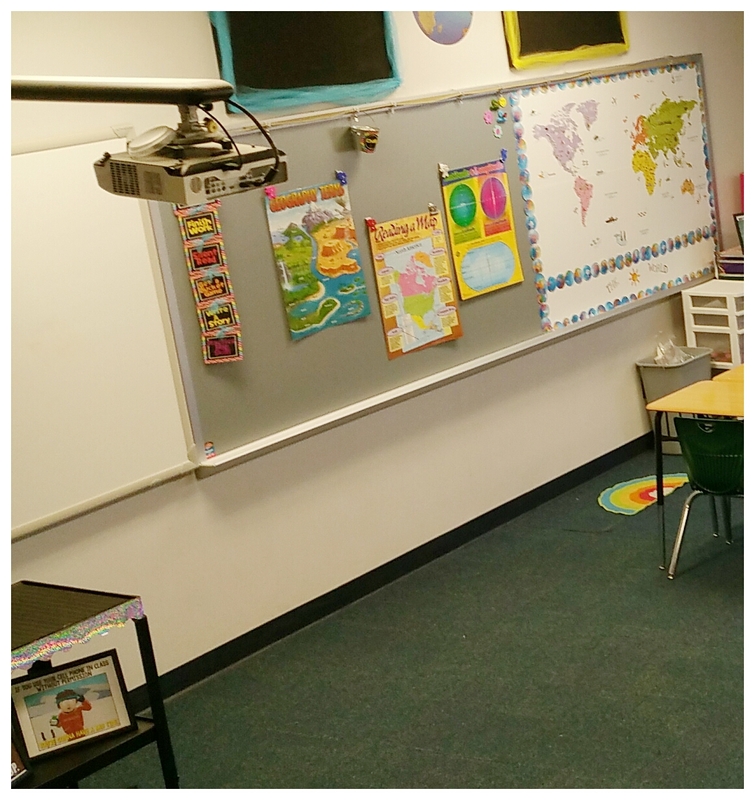 Love the U shape for kids, no one will have their back to the promethean board and or their back to me! 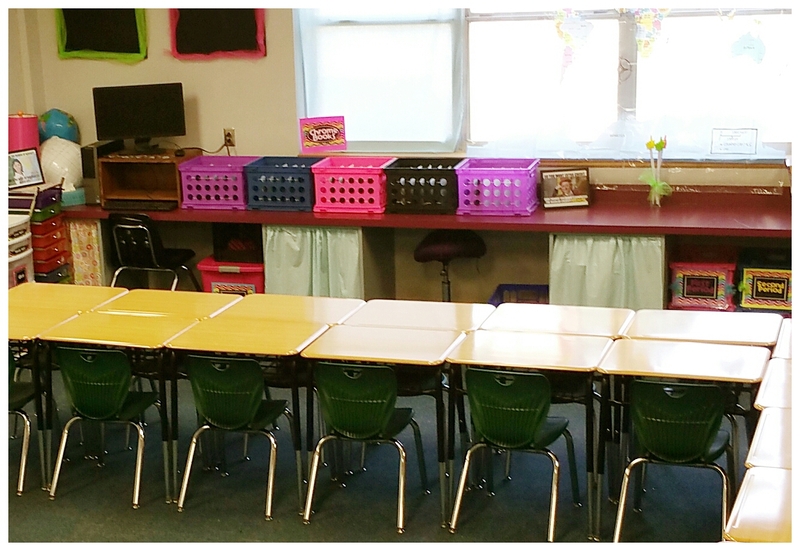 I am not sure if my new classroom is larger or if it just seems like it is since the desks are so compact. 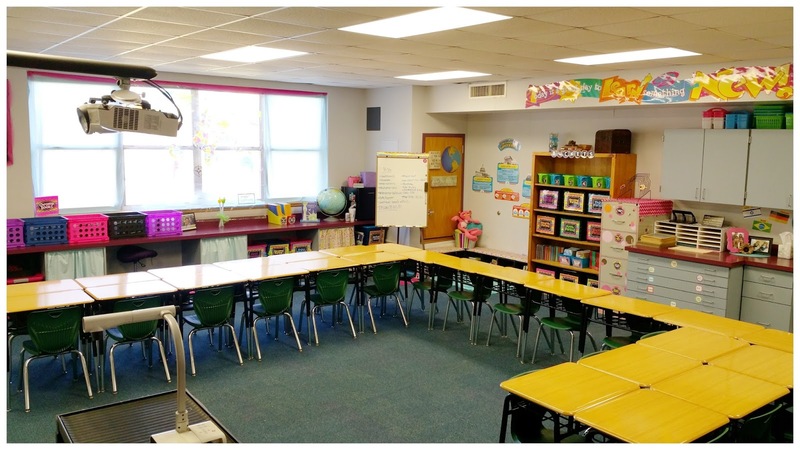 I can't believe there are 26 desks in my classroom with still tons of walking room!! Get these adorable CHAMPS pack here! I love how I can flip through them! Since this is something I haven't used before I decided I needed to hang up something that is interactive, that will make me go back there and actually use it. The green bucket belonged to my momma. 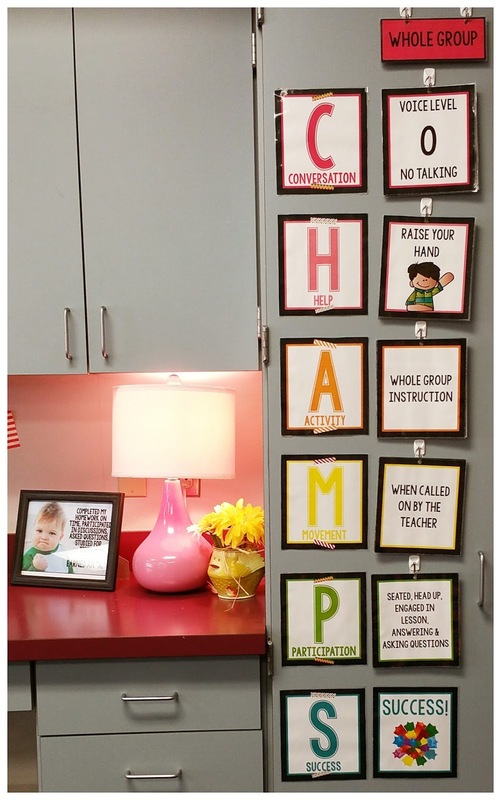 it has been in her classroom since her very first year!! I only get 45 minutes with each of my classes (6 classes, who I see everyday) so I needed something quick and easy for behavior management. I love DOJOs and I used them in 3rd grade, but when it came time to turn in the points for prizes it would eat up an hour of our time -- something I can't afford in 6th grade. SO, I decided I would try tickets. I plan on passing them out when the students are working nicely, on task, participating, ect... and they would write their name on the back of them and keep them on their desk until the end of the period. I just noticed 4th period side popped up! Hot Glue STAT!! On their way out the door they will drop their tickets in their class pail. I will randomly draw for a prize that I have already chosen (coupons for various things, gel pens, treasure box). For example, everyone is working and I will say "I think it is time to draw a name for this gel pen" draw a ticket and give that child their prize. I may draw every other day, once a week or twice in one day! Who knows! I am hoping it will keep them on their toes! 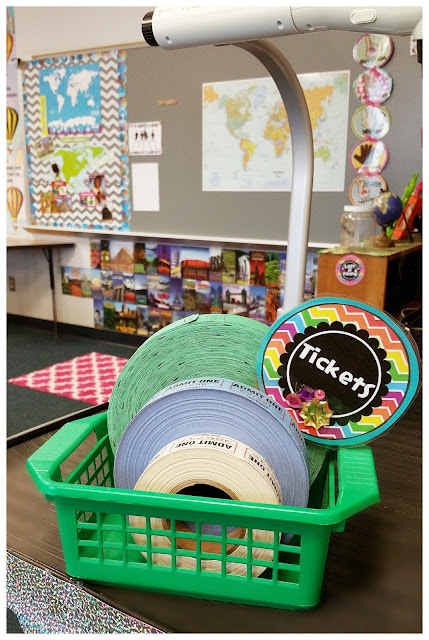 Later in the school year I will put the prize choices on a poster board and cover them up with scratch off stickers, and when I draw their name they will be able to go scratch off for their prize! Get this awesome template FOR FREE here! Bathroom Visits. 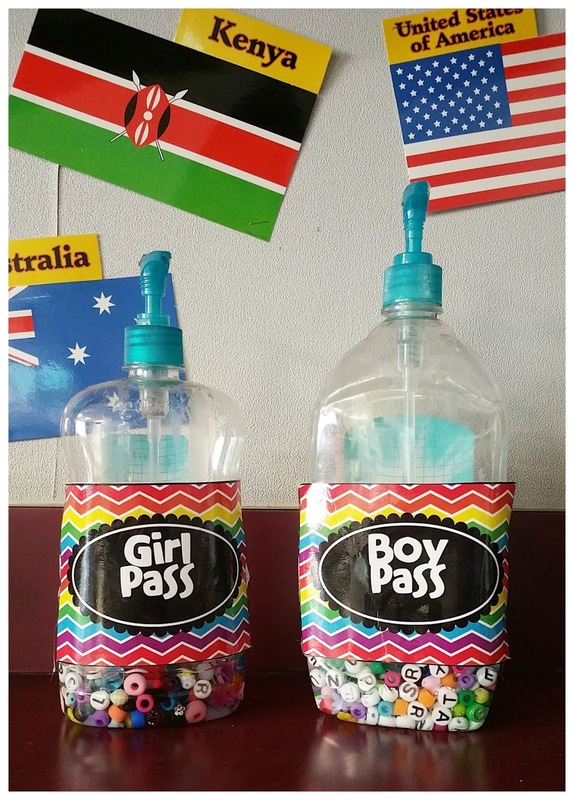 That is one procedure I was concerned about, until I found these amazing POTTY PASSES!! 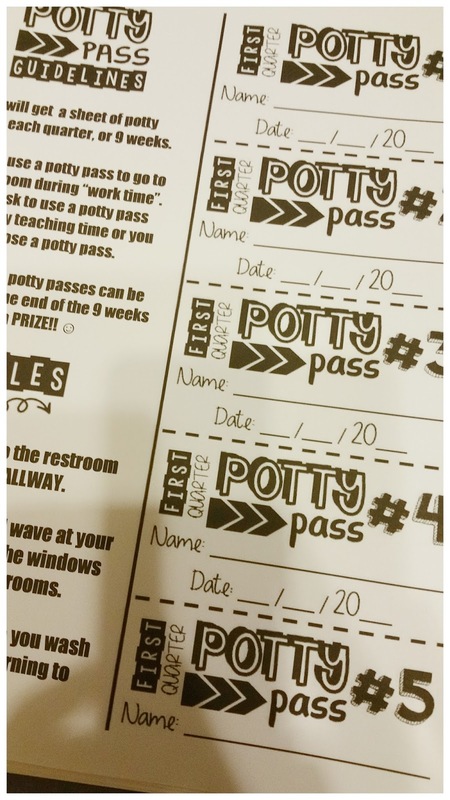 Each student will get 1 sheet of 5 potty passes for the entire 9 weeks that they can use during "work time". Any tickets that they have at the end of the 9 weeks will earn a prize! A few of my teammates loved the idea and we are hopefully going to do it team wide. If the students have 1 ticket left over they will be able to buy themselves into a movie during our collaboration time and if they have more tickets leftover they will get to buy snacks to go with their movie. The goal is that this motivates them enough so that they stay in their classrooms unless it is an emergency!! 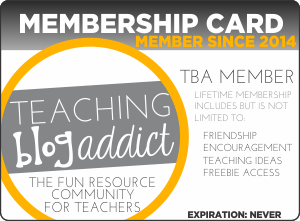 Get the labels at my TpT store here! If they do use a potty pass, after they turn it in to me they would get their hand sanitizer and but it on their desk. This way I know who is gone and I don't accidentally send a bunch of boys or girls to the restroom to socialize AND they get some hand sanitizer when they return! I'm done! Now What? 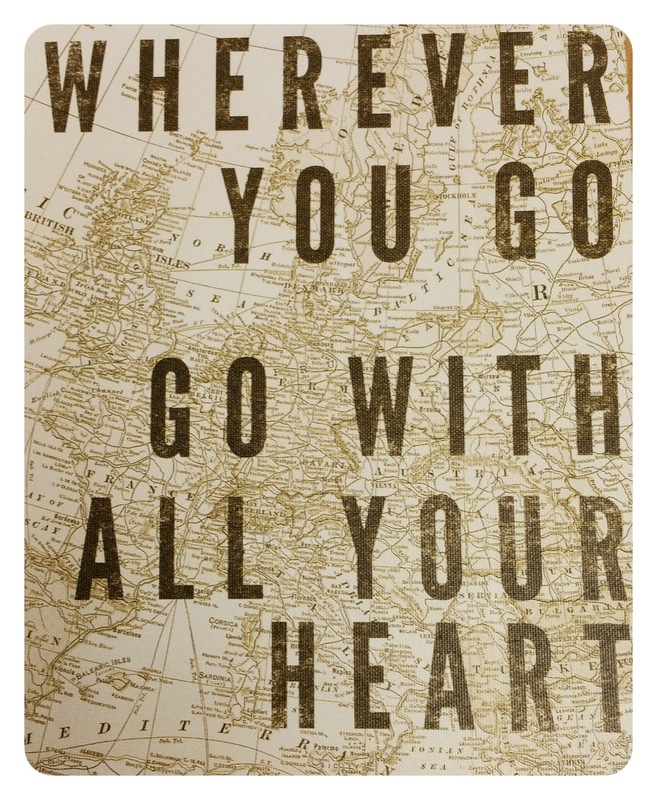 signs available at my TpT store here!! "I am DONE! Now WHAT?" the question that haunts all teachers. I am not foreseeing a lot of this since I only have 45 minutes, but you always have those few kiddos that finish eons ahead of everyone else!! "Finish Work" = any unfinished work they have from any class. 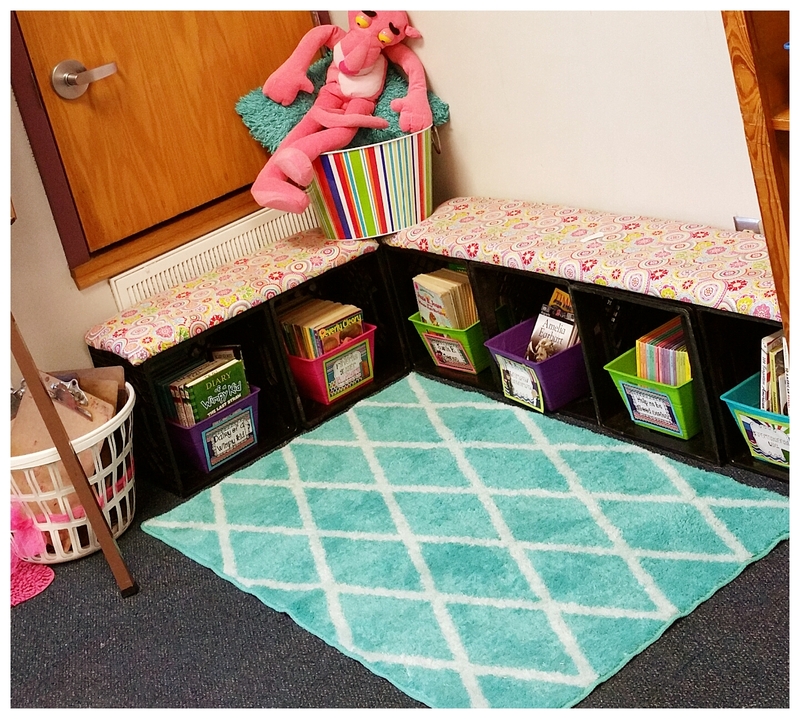 "Silent Read"= I am a reading teacher at heart, so I can't not have this option! 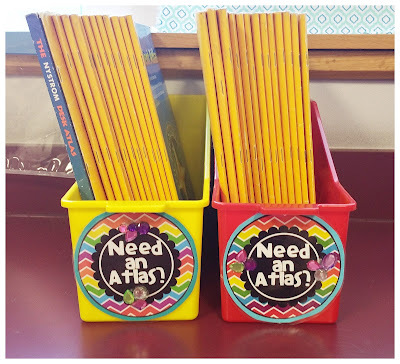 Any book from the school library or they can visit my classroom library. 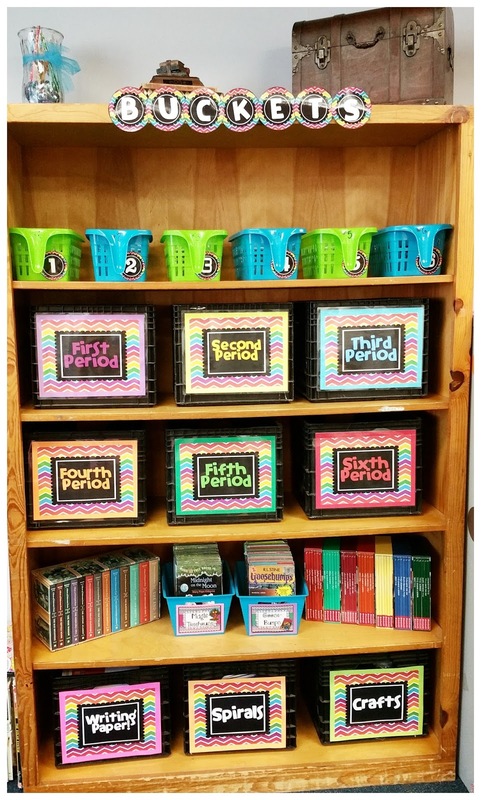 "Get a Bucket Game"= I have buckets on my back bookcase that will have social studies games in them. "Write A Story"= any writing is good writing. 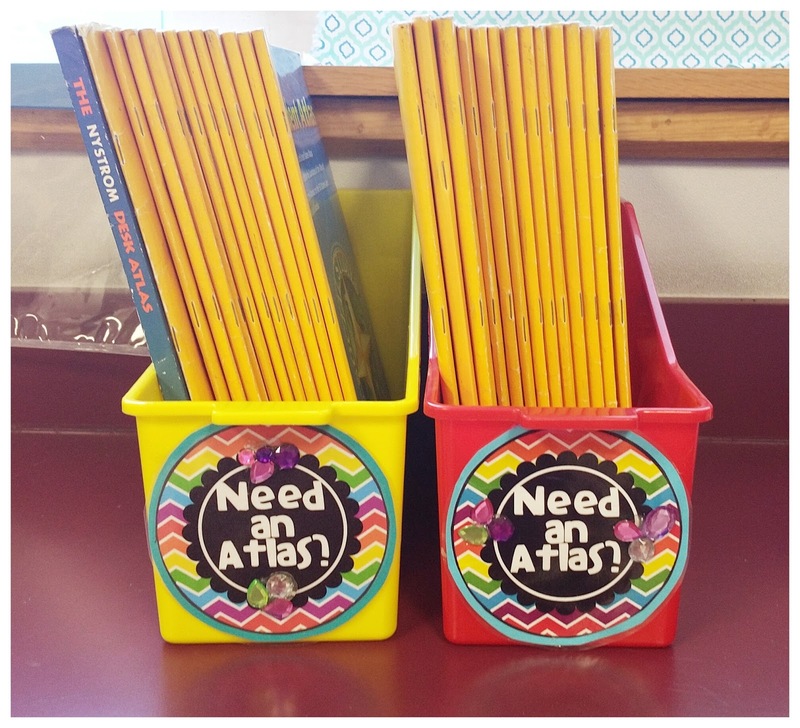 "Practice Map Skills"= On Popsicle sticks I have written different places for the students to find in an Atlas. Love adding bling to my labels! Love matching all my labels. SO bright. SO organized!! My back bookcase. The bucket games are kept here along with the tubs for each classes interactive journals. 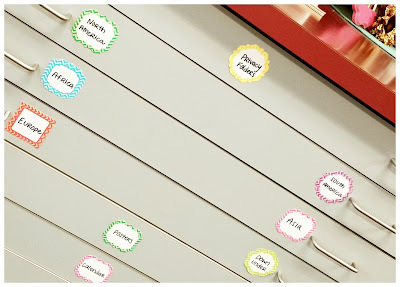 I plan on creating their journal activities as we go which will go up for sale in my TpT store in June 2016. 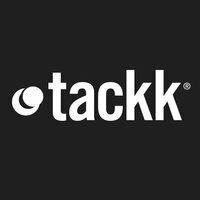 I will also post our activities as we go along here. Next to the bookcase is my library! A condensed version of the one I had in my 3rd grade classroom! 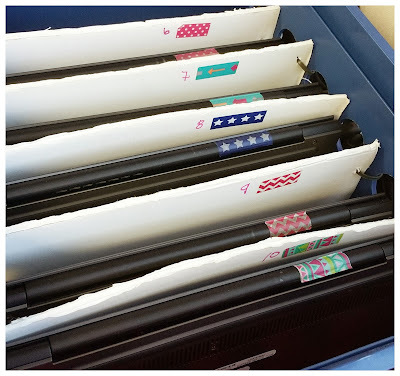 Nothing better than 25 chromebooks already organized for you!! This year I was blessed with a class set of chromebooks and I AM SO EXCITED. I can't wait to get my Google Classroom on and go digital with these techy kids!! These chromebooks and their incredible organization system was donated to me by Brooke Lowery, an INCREDIBLE teacher who has gone onto a bigger and better role in our district. They are in 5 crates that have been separated by a strong foam like board you can get from Hobby Lobby. Using different tapes she taped the computer, the board and the charger (not pictured). The chargers are fed through the holes and are all connected using extension cords that are hid behind the tubs. INGENIOUS!! They are numbered so each kid is getting the same chromebook and can be traced back to them. 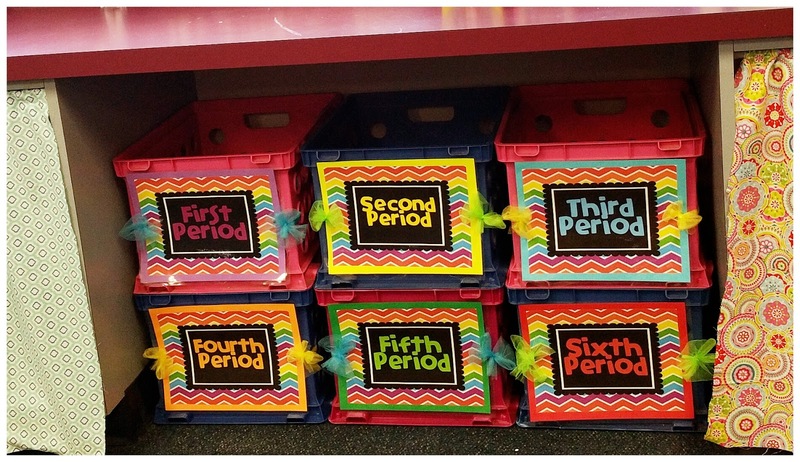 There are 5 chromebooks in each tub. 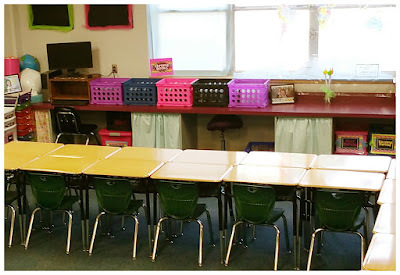 The 5 Chromebook tubs sitting on the back counter, and you can't even see the chargers! NO FUSS! NO MESS! I plan on getting a board to go on top of the crates that my sweet hubby will drill holes on both ends so I can lock them up to prevent any sticky fingers from walking away with them. The first several times we use them I will be passing them out and collecting them until I feel confident that they can get them and put them back on their own. Best Amazon find ever! Get it here! 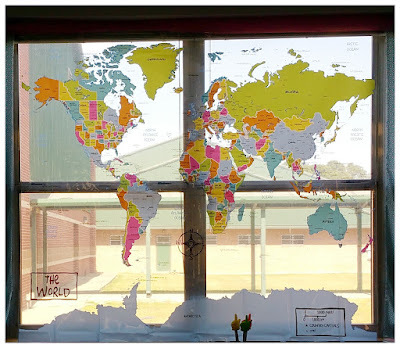 Love this shower curtain world map! It is the perfect addition to my classroom since we travel the world learning about all the different places and people! I love that it is educational while still letting in that warm Texas sunlight! GET IT NOW HERE!! Such a bargin y'all!!! Who says pointers are just for elementary?! These pointers I got for a buck in the Target dollar section is perfect for the kiddos and me to point out different places on our giant shower curtain map! 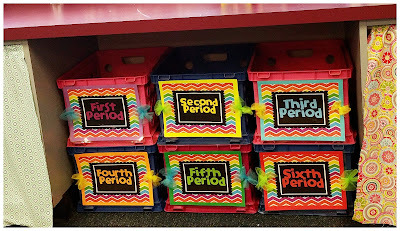 Exactly how many crates are needed for one 6th grade classroom? Underneath my giant back counter are the perfect little spaces for my many crates and tubs. There are also 3 cubbies that are stuffed full with different things that I covered up with fabric. 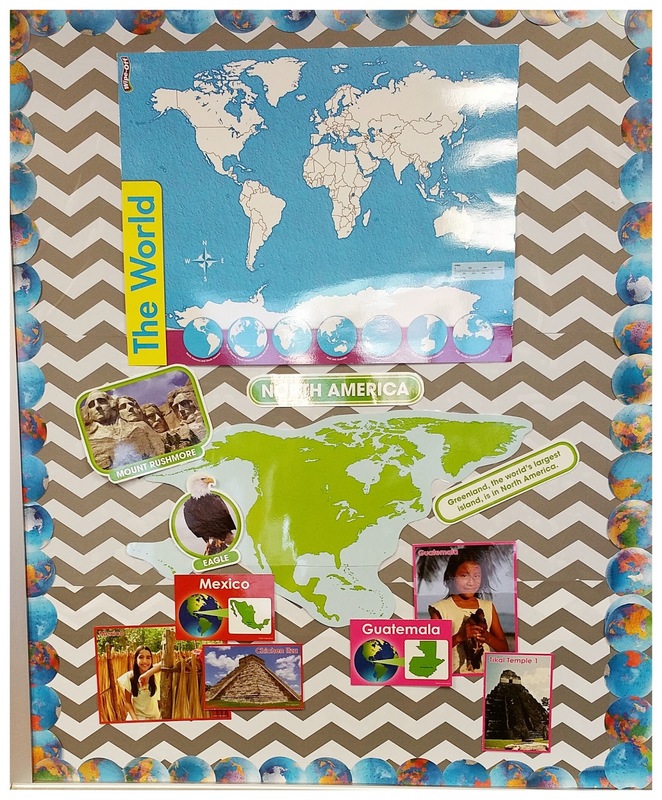 As we travel around the world and the continents come down, I will move their displays to this area underneath the other dry erase board. The best part of my room, the poster size drawers! I always try to create a teacher area that is my personal area to keep my binders, student data, resources and other things that the kids don't have immediate access to. I love the way it turned out this year! 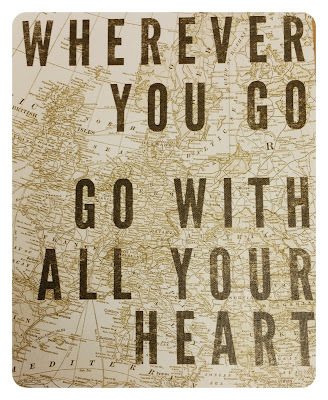 Such a true statement and so appropriate for my classroom and for me!